I had passed by Captain Porky's for years of visits to my favorite beaches at Illinois Beach State Park, and suffered instead from the fast food ministrations of Wendy's, Taco Bell or Burger King. But after reading posts titled Sailing the High Seas with Captain Porky and Places I really should go and Lobster Roll, I did, and I haven't been disappointed. I still do stop by the Culvers that opened a couple years ago, mainly because they serve less food for the buck. Yeah, sure, I could just order 1/4 lb of any of the more than two dozen seafood items or smoked and other meats, but their combo dinner, at $7.99, is an amazing deal: two meats/seafoods, garlic red or french fried potatoes, greens or slaw, and a roll or occasionally cornbread. Lugging this groaning styrofoam container to a picnic table at IBSP, I've often found it's just way too much food to finish, especially if the smoked pork shoulder is part of the equation. Dino should be as much a treasured natural resource as Illinois Beach State Park (the first nature preserve in the US, by the way). To manage good smoked meats is tough. To perfect fried foods is at least as hard. To do both, and provide friendly conversation, kitchy decor filled with alligators, a nice supply of (non-alcoholic) beverages, and fresh fish too? Almost too good to be true, like a practically-secluded beach just minutes from the north shore. Note that this is not a restaurant by the even lax definitions: There's a counter to order from, OK, not too different from other fish shacks, but a decided and complete lack of tables and chairs, not even a ledge to perch your food on. Take it across the street and enjoy the beach (and be sure to bring your trash back to a can). The fried gulf shrimp are solid and succulent, none of the watery mushy stuff I've occasionally had elsewhere. Fried to a hard crisp cornmeal shell on the outside, without flaw. And the french fries are no slouch either: double-fried steak fries crisp on the outside leaving just a puffy interior. The Captain provides two sauces (hot and mild) for the smoked goods -- or none if you prefer -- including a pretty good hot link, ribs, tips and shoulder. I've had the tips, links and shoulder, and I'd go back for any of them. But wait, there's more. He has cheese, from his own local goats (also good fried). And alligator meat (no not from his own local gators - yes I asked). Call to verify they have stuff, from the varying paper signs I see taped up I'm guessing a lot is seasonal or by special order, and Zion is a shlep and a half. I like Capt. Porky's, and I like the fact that there are now GNR nominations from places as far afield as Utica (Cajun Connection) and Zion. We are starting to cover more and more of our own geographical area. I happily second the Capt Porky's nomination. While for me it's not a BBQ destination, the couple times I have been in Zion and have stopped by I was more than happy with their fried fish and the homemade cheese. 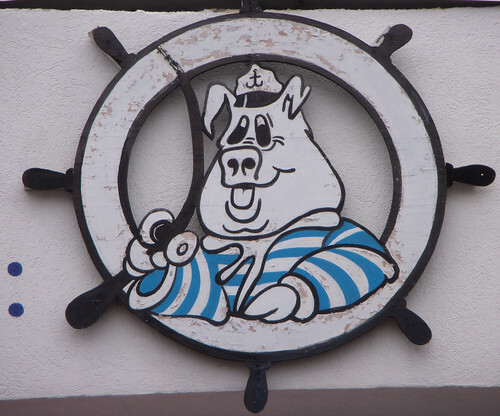 I cannot tell you the joy I am experiencing knowing Captain Porky's is now a GNR nomination. It releases me to make my nomination, because I had two places I wanted to nominate with Captain Porky's one of them. The pain and agony is having to choose only one per cycle, which I wouldn't want to change because it makes me struggle so deliciously to choose only one. My first visit was prompted by a visiting friend from Moscow. We were shopping at an Army-Navy store in Waukegan, when Feodor declared he wanted a shrimp dinner. I asked the salesperson who said they had a great place if I was willing to drive a bit. You know me, it is never too far if at the end of road there is really good food. It was love it first sight when Dino weighed the shrimp his Mother deshelled and deveined, then breaded them. I have been going back for years and always look forward to the conversation. You can buy olive oil pressed from olives grown in his grove in Greece. He has gardens at his home and farm that supply Captain Porky's with vegetables and herbs. He really does make cheese from his very own goat herd. All his vegetable and seafood salads are freshly prepared periodically during the day. He brines and smokes salmon and trout. He has the 3rd known aquarium smoker in Lake County that he uses wood charcoal and fruit woods for his BBQ. The duck and quail eggs are from his own brood. There is a lot of really well prepared food deriving from this modest looking shrimp shack. My favored shortcut to going to Captain Porky's is to exit at Delany Road northeast to Wadsworth Road, then right. When you come to the traffic light at Sheridan Road and the south entrance to Illinois Beach Park, then turn left to find Captain Porky's one business in from the corner on the west side. Oh did I forget, I heartily endorse this nomination! I believe that Captain Porky's was actually the first restaurant I discovered through LTH (or, more precisely, through Cathy2's advice). I visited Illinois State Beach and had a luxurious picnic lunch from Captain Porky's. Granted this was four years ago, but it is still memorable. As seen from my posts on the main thread...I am 110% behind this. It has to be one of the more unique chow spots in the country, amazing fresh fried seafood, including the best fried shrimp I have ever had. To go with that you got some damn good real smoked BBQ including chicken, ribs, tips, pulled pork, gumbo, jambalaya, fried cheeses/eggs made from his animal stock. Where else in the world can you get a selection like that? It would take a year of weekly visits to go thru the entire menu, I cant wait to do so, nothing bad to say about it or anything they do. I love the dedication they have to be the best at what they do..and they sure do succeed. Food stands like this one make life worth living. Finding ourselves with another odd off-school-day (and yet another coming up on Monday) we decided to head up to Illinois Beach for some Geocaching. (Actually, we could have gone anywhere, but I knew Captain Porky's was in the vicinity, so I gave the 'spouse a gentle nudge northwards) We hit the stand about 11:40 with a carful of hungry eight-year olds - as we entered, Dino was inside, carefully hacking apart an enourmous hen-of-the-woods, which we immediately ordered. We added on clam strips, fried green tomatoes, pulled pork shoulder, and smelts and sent the kids outside to the picnic area so they wouldn't destroy the place. While I waited for the food, Dino struck up a casual conversation with me that ranged from wild mushroom thieves to childrearing to food to the "old country" to the uselessness of technology. (He also lost a hen-of-the-woods this year: "$1,000 of mushroom, gone!") He battered the fried items right then, (slicing the green tomato with a huge chef's knife) and tossed them into one of a half-dozen fryers that were at the ready. On the way out the door, he gave us fishing tips and a bait shop recommendation "he's like 97 years old, but tell him Dino sent you. And if you don't want the fish, I'll take it!" Everything was delicious, unusual, and cooked to perfection. Even the picky eaters in our group chowed down (though the grownups mostly ate the mushrooms and the tomatoes, not that we complained) and filled themselves on porky, fishy, fried goodness. I made a trip to Capt. Porky's today. It's been quite a while since I've been. I can report that my impression on this trip is much the same as my last; namely that the BBQ is forgettable (or even worse), but the fried foods really deliver! Everything is breaded to order and expertly fried. We had a veritable feast consisting of fried wild (hen of the woods) mushrooms, fried green beans, fried gator, and fried jumbo shrimp. Along with the fried foods, we tried some pulled pork and a daily special seafood stew. Like I said, the fried foods are outstanding. The food is good, but Capt Porky's is more than just the food. It's a one of a kind place, just barely within the Chicagoland area, that is run by a man who is so passionate about food, that he produces many of the raw ingredients used in the restaurant. I definitely support Capt. Porky's as a GNR. I support the 2010 renewal: I still stop here regularly when I'm in the neighborhood (although that's usually warmer months, when the beach beckons). The food, atmosphere and service are still unique to the area, a true gem in a wasteland of mostly fast food chains. I go as often as I have always gone to Captain Porky's: whenever I feel like it. However the barrier to visit is dropping with the new location opening soon on US41 and Wadsworth Road. According to Dino, the move was prompted by all these new customers who are not from the Zion-Park City area. How does this happen? I pretty much stick to my very favorite hand peeled, weighed and finally bread Gulf shrimp. I might add a seafood salad with squid/octupus my current favorite. Definitely a piece of baklava. I may also buy some olive oil, duck eggs and goat cheese for another day. It is rather surprising it all comes from properties Dino owns in Greece and farms around the IL-WI border. I eat well and my mind is fed better from the interesting conversation. I'm happy to offer my approval to maintain his GNR status. Okay, I know this is a stupid question, but... does this place still exist? Last fall, Dino was saying he was closing it as of Jan. 1, to concentrate on the Shanty. Later he said he might keep the building but wasn't sure what he was going to use it for. So, have people been in 2010? - New location on 41 at Wadsworth Road is opening end of April - beginning of May. 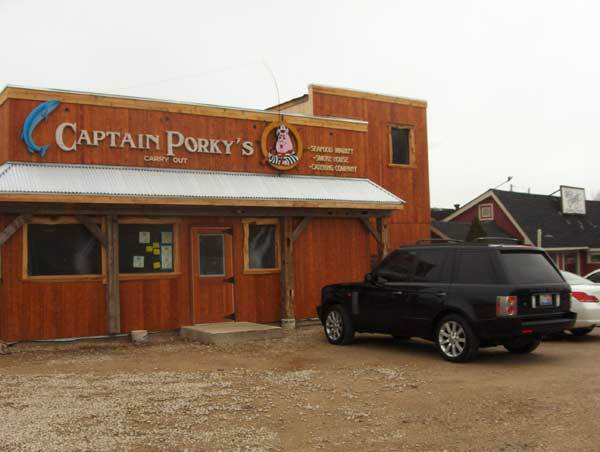 I passed it last weekend to find Captain Porky signage up next door to The Shanty. - Old location is open this moment. It will temporarily close once the new location opens. The plan is to re-open the old place. They seemed busy, thus I didn't quiz them further. Thanks for clearing that up. I was in the area a couple of weeks ago and didn't stop in because I assumed it had long since closed. Oh well. For those who do visit, if Dino is around be sure to get some of the parmesan he makes from his goats' milk. As with pretty much everything else in the universe, he'll be more than happy to deep fry it for you. Cathy2 wrote: Old location is open this moment. It will temporarily close once the new location opens. The plan is to re-open the old place. Very glad to hear that, as I'll be up in Zion tomorrow -- first chance to get to the beach this year! [later] Delicious shrimp as always -- new item is Fried Okra. Good, but not the best I've had. Yesterday, I stopped by Captain Porky's soon to be new location next to this son's restaurant The Shanty on US41 in Wadsworth. I then quickly popped over to the old location on Sheridan Road, which is still open with Dino at the helm. He promised we would all love the new location. The siding is recycled from local barns.